Over the past few weeks (and for another week to come) the crew has been potting-up in the greenhouse. 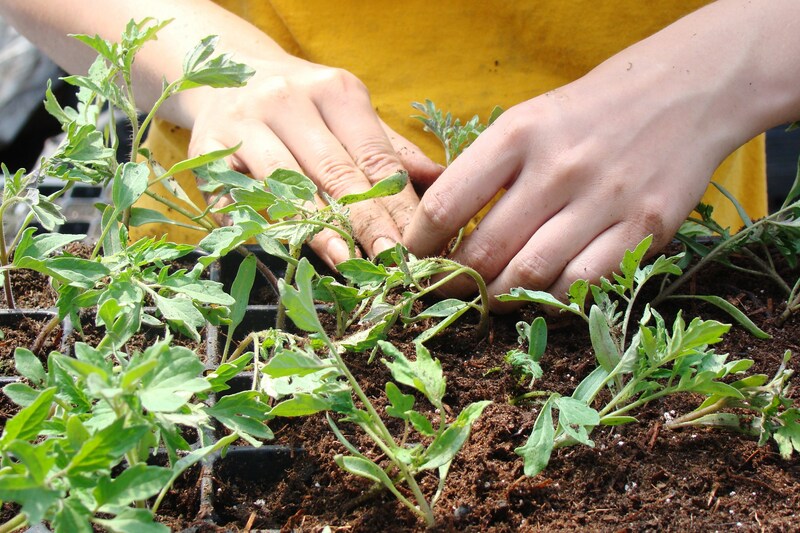 Potting-up is the term we use to describe the transfer of a plant from a small cell to a larger cell or pot. 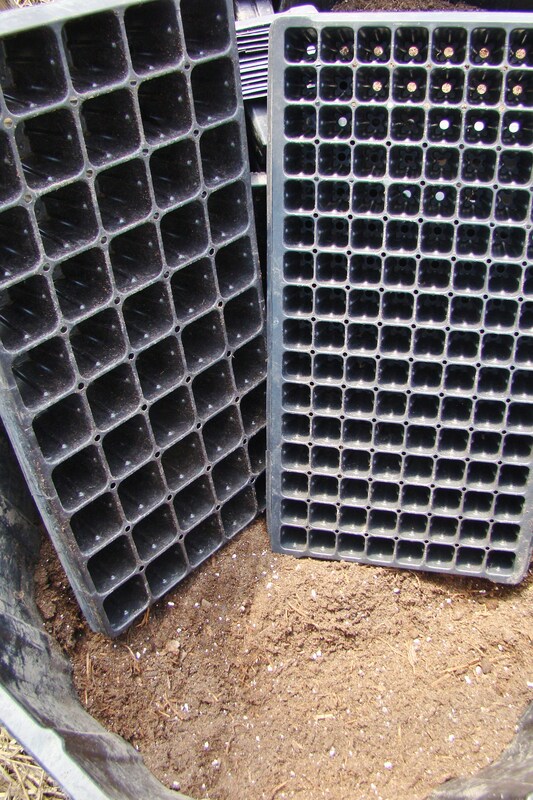 Cells are the individual spaces in a plastic container called a flat. 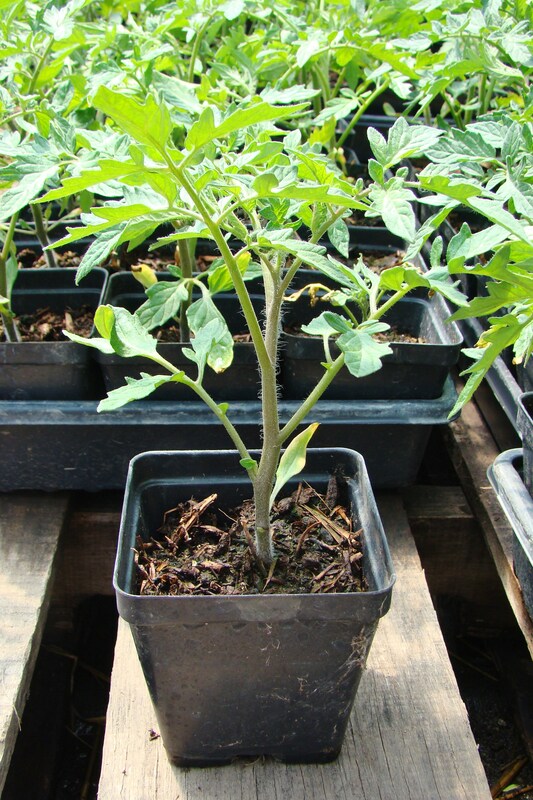 The plants that we pot-up the most are tomatoes and peppers. Why not simply start the seeds in the larger containers in the first place, thus avoiding the additional task of potting-up? Available space is one reason. Our greenhouse has limited space and in March and April a lot of different seeds need to be sown. By sowing the tomato and pepper seeds into small celled flats we are conserving a lot space. By the time we are ready to pot-up the tomatoes and peppers in April and May some of the other plants like onions and cabbage have been moved outside, thus freeing up space in the greenhouse. If we plan it right, the timing lines up perfectly. Also, by starting the tomatoes and peppers in March and April they get an early start and are bigger, stronger plants by the time they are planted in the field in May. Another reason for starting seeds in small sized cells is that we do not want to waste precious organic potting soil on a seed that doesn’t germinate. Therefore it is much more economical to start the seed in a little bit of soil (just enough to keep the seed moist until germination and offer nutrients for a few weeks) than to start it in a cup or 2 of soil and risk having to discard all of the soil if germination doesn’t occur. When we pot-up we fill the new larger cells or pots with a mixture of potting soil and mushroom compost. The mushroom compost is also known as “Spent Mushroom Substrate” which is the composted result of the rich medium that mushrooms are grown in. We like to use this compost to pot-up because of its excellent ability to hold moisture and for the nutrient content it can offer the plants. Thousands of little peppers and tomatoes have already been potted-up, and there are still thousands to go! 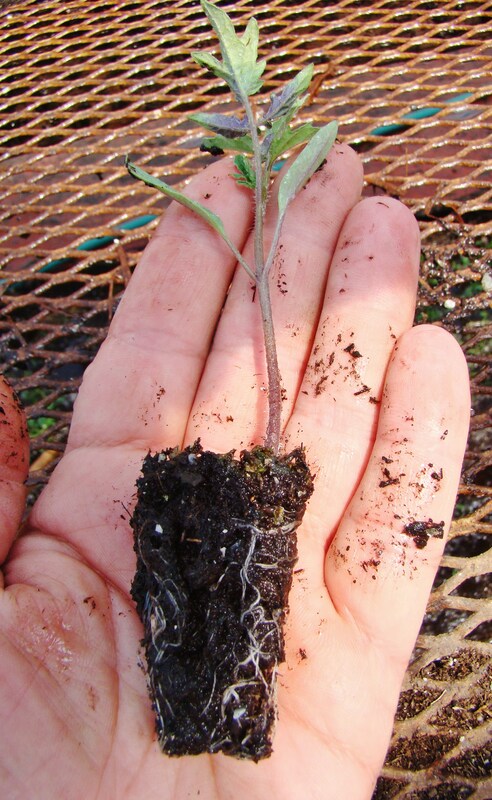 This little tomato seedling is ready to be put into larger cells or a 3 inch pot.